Radical surfing dream team "The Hang Five" puts Cody and his friends to the test. Back in 2007, the animated adventure Surf’s Up failed to find much of an audience. Despite a lot of promotion and a cushy summer release date, the film snared a lackluster $58 million in the US. 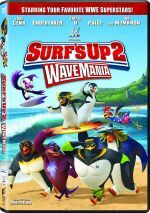 Which may be why it took 10 years for the movie to produce a sequel: 2017’s direct-to-video tale Surf’s Up 2: WaveMania. 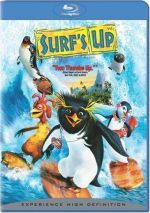 In this new adventure, we reunite with surfing penguin Cody Maverick (voiced by Jeremy Shada), his girlfriend Lani (Melissa Sturm) and his pal Chicken Joe (Jon Heder). In the first film, Cody gave up a major surfing victory to allow Chicken Joe to win instead. Though Cody appeared to be a rising star in the surfing world, this act of sacrifice relegated him to semi-obscurity. Along with Lani, Cody runs a surfing school that struggles to succeed, all while Chicken Joe enjoys fame and fortune. As a child, Cody idolized celebrity surf team “The Hang Five”, so he gets excited when they visit his home area. They need a new member for their group, so Cody, Joe, Lani and old rival Tank (Diedrich Bader) vie for this position. When the first Surf’s Up hit in 2007, it did so in the midst of a spate of penguin-based films. Despite that “me too” quality, the movie managed to offer a bit of fresh air, partly due to its unusual storytelling style. Up opted for a faux documentary style that worked surprisingly well and gave the film a nice twist. WaveMania doesn’t totally abandon that conceit, as it occasionally intersperses clips from a sports network that follows the proceedings. Nonetheless, these appear too infrequently to be the major stylistic choice that we found in the first movie – indeed, they feel gratuitous much of the time. Perhaps that’s inevitable, since WaveMania lacks much organic reason to exist. It feels like a piece of product meant to renew life in a dead franchise, so it comes without any signs of inspiration. Oh, sure, WaveMania comes with moral objectives, but it essentially develops the same theme as the first movie, which seems like an odd choice. If the film wants to teach a lesson, why not make it something new? While the first flick was essentially a character journey, WaveMania wants to be a big Indiana Jones style action movie. These choices feel strange for this series and don’t really fit. The entire long series of events on “Slaughter Island” may purport to test the characters, but they’re really there for gratuitous stabs at action. There’s that word again: “gratuitous”. I can’t help but think it’s the term that best fits WaveMania, an animated adventure with no obvious reason to exist and little inspiration. Make no mistake: I’ve seen worse cartoon sequels, so despite its lack of purpose, WaveMania comes with the occasional nugget of entertainment. These simply fail to appear with much frequency, so most of the movie feels “by the numbers” and uninspired. “I’ve seen worse” isn’t a phrase that sounds like much of an endorsement, and it isn’t. WaveMania becomes a fairly painless 84 minutes and nothing more. Surf’s Up 2: WaveMania appears in an aspect ratio of approximately 1.78:1 on this single-sided, double-layered DVD; the image has been enhanced for 16X9 televisions. This seemed like a decent but unexceptional presentation. Sharpness took a hit. Much of the film offered fairly good delineation, but occasional instances of mild softness occurred. Even when I lowered my expectations to suit the SD-DVD format, I still thought definition came across as a little lackluster. No issues with jagged edges or shimmering occurred. I also saw no signs of source flaws. Colors tended toward a blue or purple tint. These showed moderately positive vivacity – they could’ve been more dynamic but they looked acceptable. Blacks were a bit inky, while shadows showed reasonable clarity. In truth, the movie looked perfectly fine, but I thought it was less than exemplary given expectations. With a fair amount of action on display, WaveMania brought us an occasionally lively Dolby Digital 5.1 mix – though not one with a ton of ambition. Surfing scenes offered the highest levels of activity, as these used the five channels in a moderately peppy manner. General ambience was less convincing, though, as the mix oriented toward “big moments” well but became less invested during other scenes. Still, the track added some life at times and had a few exciting moments. Audio quality was fine. Music showed decent pep and range, while effects had moderate impact. Speech was natural and concise. Nothing here impressed, but the mix felt more than adequate. A smattering of extras fill out the disc. Bloopers runs one minute, 20 second and provides the “fake goof-ups” pioneered by Pixar. They’re not especially amusing. A featurette called Behind the Mic lasts three minutes, 55 seconds. It presents comments from actors John Cena, Triple H, and Michael Cole. “Mic” looks at cast, characters and performances. Little actual information appears in this puffy piece. Next comes Chicken Joe’s Extreme Slaughter Island Tour. It fills five minutes, 10 seconds with observations about the movie’s main location. It offers basic educational comments about concepts found in the movie, so it may be interesting for kids. How to Draw Your Favorite Characters breaks into three subsections. Presented by director Henry Yu, we get tutorials for JC (3:00), Cody (2:11) and Chicken Joe (3:00). This turns into a mildly fun experience. Finally, Inside the Music with Toby Chu lasts three minutes, 30 seconds. Composer Chu discusses his work on the film in this short and only occasionally informative reel. The disc opens with ads for Smurfs: The Lost Village, The Swan Princess: Royally Undercover, The Swan Princess: Princess Today, Pirate Tomorrow and The Angry Birds Movie, Apple Of My Eye and Open Season 3: Scared Silly. No trailer for WaveMania appears here. Why did it take 10 years for a sequel to Surf’s Up to arrive? I have no idea, but the bland and forgettable Surf’s Up 2: WaveMania isn’t worth the wait. The DVD offers mostly good picture and audio as well as insubstantial supplements. Though not a terrible animated tale, WaveMania seems mediocre even at its best.